After few days of anxiety and speculations, Ambassador Victor Bockarie Foh (Photo), Sierra Leone’s Ambassador to the People’s Republic of China was announced and sworn-in as the country’s new Vice President on 19th March 2015. The jubilation that greeted the announcement was ecstatic, as if the public had had wind of the President’s “inner mind”. Ambassador Foh was not among the many names that made the rounds in the media, the gossip columns and even on the “bush” radio. As cleavages formed around one or the other names that had been brandished, the President made the right choice: a neutral and non-ambitious, but a forthright Vice President would provide him with the greatest asset. That asset was found in Victor Bockarie Foh, a seasoned, experienced and capable administrator, a conviction and strategy politician, a well-mannered village boy with resourceful education and adequate exposure to bring to the job. The commitment of Vice President Foh to serve President Koroma and country is unquestionable, and has been rewarding, so far. Barely three months into office, he has shown signs, and achieved results that his predecessors could not achieve in their terms. He is modest about these claims. “We came at different times, we had a different agenda and different challenges”, he said. “But a lot more would have been achieved, and we must be in a hurry to achieve tangible and lasting goals”, he concluded. His desire is to “support the President and all well-meaning Sierra Leoneans to take Sierra Leone to an enviable level of development”. In his first 100 days as Vice President, Ambassador Foh travelled across the country, mobilizing and sensitizing people about the Ebola Virus Disease. This has been a hugely rewarding venture, particularly as we continue to fight the dreadful Ebola Virus. First, he engaged his Guinean counter-part in a remote village on the Sierra Leone-Guinea border, to share views about the scourging Ebola Virus Disease, which has been ravaging the two countries. In addition to the meetings of the Mano River Union Heads of State on the EVD, the meeting between Vice President Victor Bockarie Foh of Sierra Leone and the Prime Minister and Head of Government Business of the Republic of Guinea, H.E. 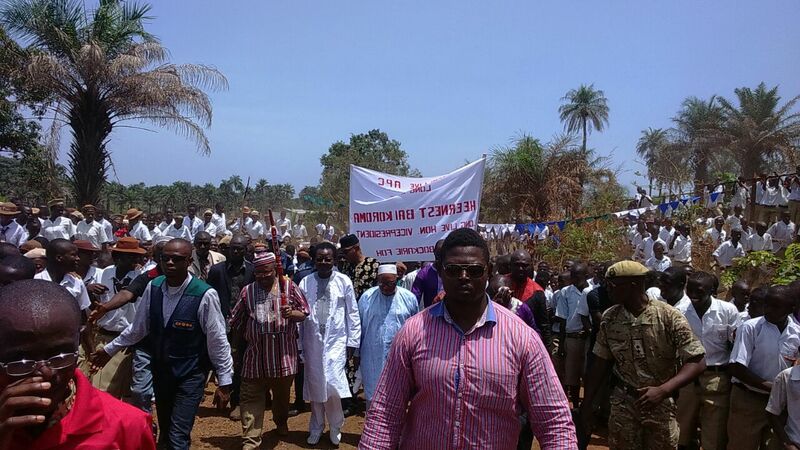 Mohamed Sahid Fofanah was most successful in sensitizing border towns and communities to contain the disease. Vice President Victor Bockarie Foh also used those visits to “kill many harmful birds”, resolving community disputes; commissioning new projects; preaching Religious tolerance; visiting schools and admonishing school children to be studious and law-abiding; teachers to be disciplined and dutiful; and parents to allow their children and wards to go to school. Among many other things, he resuscitated fun and cherished memories of the founding fathers of the APC Party, and in the process, complemented the on-going efforts of President Koroma to consolidate the Party. What about coordination of Government business? He has been remarkable. In a professionally structured manner, Ministers and their staff, including a number of sub-vented agencies have updated the Vice President on the activities of their ministries. Being an accomplished administrator, Vice President Foh has been quick to identify and address challenges impeding Government Business. 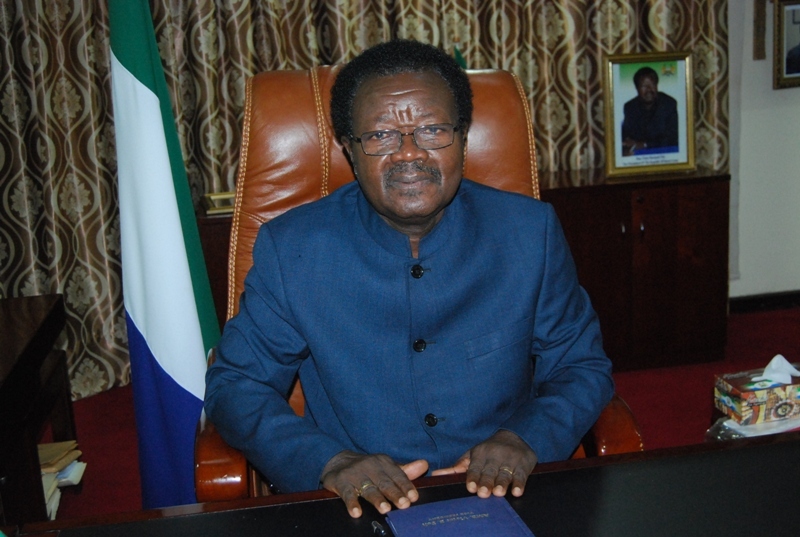 Arguably, one area that has attracted the attention and admiration of His Excellency the President most in the first 100 days in office of Ambassador Victor Bockarie Foh, is the swiftness with which he has resuscitated and re-energized the Inter-Ministerial Committee on Decentralization. It would interest anyone to know that as a key Governance and Coordinating Agent for Decentralization and Local Government, the Inter-Ministerial Committee has not convened for over four years. Attended by almost all Ministers and Deputy Ministers, including Administrators and Professionals, the Vice President, on 19th May 2015, underscored the relevance of Local Government for the growth of any nation. He emphasized on the need to resource Local Councils; on Capacity Building; on devolution of functions and on clearly defined roles for effective service delivery, amongst other things. In the midst of these accomplishments in his first 100 Days in office, Victor Bockarie Foh does not see himself as a great man. He sees and regards himself as an ordinary Sierra Leone who, like all else of voting age, has only one vote. Beyond that, he can only use his humility to persuade the grassroots to think and vote for a party that cares for them, the All People’s Congress Party. He strongly believes that his rise to political power has been “guided by the Grace of God and my commitment to my Party, the APC. I believe in steadfastness, commitment and devotion to a cause, be it political or otherwise”. “It is that commitment, devotion, trustworthiness, respect for others and service to country and humanity that I will bring to bear on my current assignment”, he concluded. 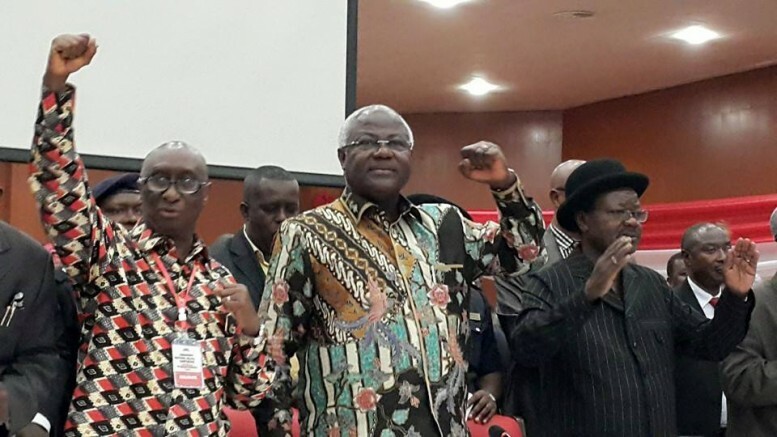 Undoubtedly, in 100 days as Vice President, Sierra Leoneans have not only seen a committed and conviction politician as second-in-command in the person of Ambassador Victor Bockarie Foh, but also, have seen a new team and a new direction led by President Ernest Bai Koroma. Many thanks for the clarification Ahmed. As I indicated in my piece Sierra Leone Telegraph is, in my view, heads and shoulders above the rest. My reasoning for coming to that view was clearly spelt out in my piece. And I definitely wouldn’t want to see anything changed about the paper as long as it holds fast to its core principles. I suppose though that perhaps it would have been helpful if the background of the author of the article had been made clear. This could have provided the all important context as to where they may be coming from. Unfortunately some readers may not be privy to such background knowledge which could lead them to make the wrong assumptions and conclusions. Clearly I wouldn’t have expected balance if, as you indicate, the author is no more than a HMV. Thanks for the clarification. The sierra leone telegraph is the only paper that permits publication of different political views and arguments. We need this in order to understand what others think. John Baimba Sesay is paid by the government to act as one of its propagandists. Love him or hate him, he is doing a very good job for his money, and better at it than the opposition camp I think. Why don’t the opposition send more of their articles to the telegraph, so we can understand their policies, and to help us make up our minds about all of them? I wouldn’t want this paper to change its editorial policy only to become monolithic. It is a matter for serious debate, whether the VP has done anything positive in his first 100 days, and should be open to scrutiny. This is the only paper that gives us the opportunity to do that, so let us not kill it. Please let us all be tolerant of the views of others, so that we can continue to build a better and democratic salone. Keep it up salone telegraph. We need this open debate. Hi Amjata and Shiek. I can understand your frustrations. I am not too clear about the link to the Awoko paper but my beef is that this very unbalanced article has no place in this hitherto (for me) highly esteemed newspaper. I discovered this paper about two months ago and I swore I had discovered the best thing since sliced bread. I am beginning to think otherwise though! If this kind of clap trap was been peddled by any of the sycophantic ‘worwor’ papers – aka HMV papers I wouldn’t bat an eyelid. It is their modus operandi. But even within this short period of knowing this paper I have come to expect more. In my view they had set the bar very high in terms, for example, of balance, insight, analysis, honesty, quality, standard of language to name but a few and for which I wholeheartedly applauded them. But not with such shameless unbalanced ‘battoes’ (Krio slang for praises – I can only hope I am not showing off my age using that slang. If so please forgive the senior moment). You really want me to believe that Victor Foe is all of a sudden (within 100 days) whiter than white? ‘Monkey kin lef en black hand’? The mind boggles! These stupid news papers really think that president Koroma is a Saint. Where was he during the civil war? oh, I know; he was selling his fake insurance policy to most of the Sierra Leoneans. Hi Amjata, I totally agree with your comments. Awoko is a APC news paper and they can do anyting deceive the public of Sierra Leone. That’s what they are known for. Awoko will not tell you anything about uplifting. 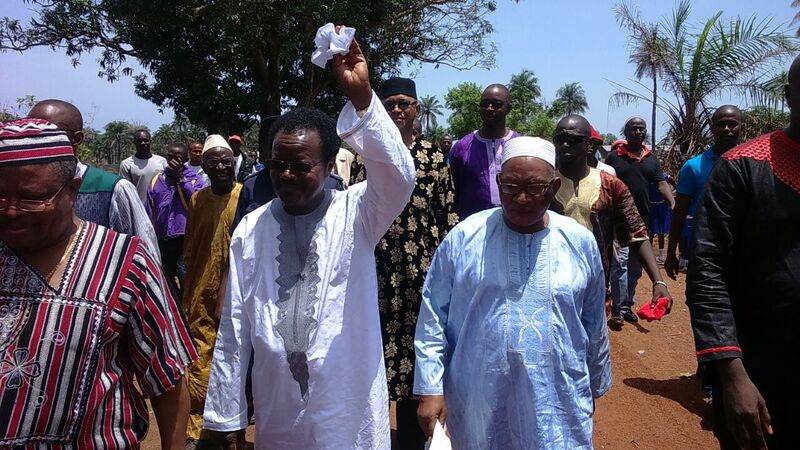 Awoko is known of praising Koroma at any cost. Like the article I just read on Awoke online news, where the author laments the deplorable state of affairs in Sierra Leone – we continue to import rice despite the promise of self-sufficiency in rice by 2011, the electrification of the whole of Freetown within 100 days of EBK government, provision of drinkable water, etc. etc. These are issues that matter to the people of Sierra Leone, why don’t you write about that; instead you deceive yourself and your ilk about what a wonderful and farsighted decision to appoint Victor ‘tif man’ Foh as VP, an illegal act. And what about your ilk that has caused the deaths of so many of our compatriots due to lack of basic protective gear – because the money that well-meaning Sierra Leoneans provided to your government was used by corrupt elements to build mansions and support their legions of concubines. Why don’t you use your writing to provide insights to your readers about these failings in present day Sierra Leone. Why don’t you provide answers to the questions raised by the author of the Awoko article, since you seem to know all. Miss Amjata, the deplorable state of Sierra Leone is not caused by one person, rather by all Sierra Leoneans. I would like to draw your attention to the fact that the political infrastructure of the country is still very fragile, due to the fact that we are still recuperating from the civil war and the Ebola war. These two wars have torn apart the the economy of Sierra Leone, and it will take 10- 20 years to rebuild it. Praising the vice president Victor Bockarie Foh, under the leadership of president Ernest Bai Koroma for an outstanding work done in the country within a very short time in office, is no crime committed by the Telegraph news media. Yes he deserved the praise.